It is now or never: Rounds 5 and 6 of Women’s EHF EURO 2018 Qualification, played from Wednesday to Sunday this week, will see the remaining 12 places decided , and the pressure is on with some of the world’s top-ranked teams still to clinch their berths – or in danger of missing a place in France altogether. Defending champions Norway, EHF EURO 2012 winners Montenegro and 2016 semi-finals Denmark are the only teams assured of their place in the final tournament, alongside hosts France. EHF EURO 2016 silver medallists Netherlands and 2016 Olympic champions Russia are among the sides yet to qualify for the EURO 2018. Seven teams enter the final rounds on six points, needing only one victory to book their ticket to France. The race is well and truly on to finish in the top two positions in each of the seven playing groups, but the best third-ranked team is also to be decided. Switzerland take on Croatia with the chance to qualify for their first EHF EURO since 2006. If they win the encounter in Sursee, they will secure Group 1’s second ticket, after Norway booked the first in round 4. 2012 semi-finalists Serbia – including top scorer of the qualification phase, Katarina Krpez Slezak (35 goals) – can book their place in France with an away win versus Faroe Islands. Spain, Sweden and Hungary could also clinch their berths in France on Wednesday, if they beat Turkey, FYR Macedonia and Kosovo in their respective away matches. The second and third top scorers of the qualification phase, Slovenia’s Tjasa Stanko (recently named best young player of the Women's EHF Champions League 2017/18) and Ana Gros, will lead their team in a crucial clash versus Denmark. Austria enter the Round 5 clash against Romania level with the World Championship 2015 bronze medallists on six points, with the chance to return to the EHF EURO after last contesting the event in 2008. Top scorer of the EHF Champions League 2017/18, Cristina Neagu, hopes to lead Romania to a win in the decisive clash versus Austria – the winner of this match will book a ticket to the final tournament. EHF EURO 2016 runners-up the Netherlands can secure their place in France if they beat Belarus in Minsk – or could find themselves in danger of missing the EURO if Belarus take a victory at home. 2016 Olympic champions Russia are currently third in Group 4, two points behind Romania and Austria. If they do not qualify for France, it will be the first EHF EURO the team has ever missed. The final round of qualification matches will see nine games played on Saturday June 2, and the last five on Sunday June 3. The best third-ranked side will not be known until after this round, when the top two teams in each group are confirmed. If they win their Round 5 encounters, Norway, Montenegro and Denmark could enter Round 6 with the chance to finish the qualification phase undefeated. 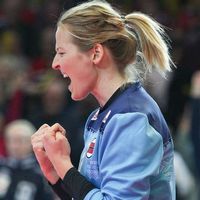 Germany captain Anna Loerper will play her last match for the national team in Gummersbach, after 13 years representing her nation.